As I laid awake unable to sleep last night I thought of my Half Marathon success and there were a few key items that I used during the race that I felt deserved a special mention. These items were a hit and I will definitely be using them in all my upcoming races. Races2Remember Smart Pace Band: This pace band was an invaluable tool I utilized to help me achieve my goal time of 1:54:36. This band does not contain even splits it is actually customized to the race course adjusting your pace per mile accordingly. The pace per mile increases with difficult areas such as hills and decreases during flat and fast areas to allow you to easily reach your goal. This band also lists the accumulated time you need to be at per/mile to meet your goal time. I found this bracelet to be the best tool I had during the race, it provided me with the confidence I needed to know I was on track to meet my goal. I also wear a Garmin which tells me my pace and mileage but even though I love my Garmin I felt during the race the pace band made it easier for me to know I was on track to finish in my allotted goal time. These bands cost $7.00 for three with minimal shipping unless of course you do not allow for enough time before the race and need 2-day or overnight shipping to get them on time. You also get to add words of encouragement on the bracelet from an extensive list provided or you can customize the bracelet with your own mantra. I will be using these bands for all my future races and you should definitely give them a try….you won’t be disappointed. Bondi Band: My friend Crystal and I also wore the Bondi Bands I had customized. I absolutely love these bands not only do they keep my hair out of my face they also keep the sweat from dripping in my eyes!! The Bondi Band stayed in place the entire race unlike other bands I have tried in the past that always fall off my head. These bands are a definite must during races and training so be sure to check out their website and order some right away! 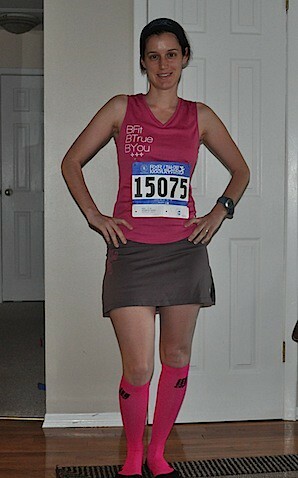 CEP Compression Socks: Last but not least were my hot pink CEP compression socks. I have been using compression socks throughout my training and they do make a difference during running and recovery. Compression socks increase arterial blood flow and oxygen delivery to the muscles which increases performance and decreases recovery time. I have also found them beneficial to managing my shin splints. My performance has been enhanced by using these socks and my recovery time has definitely decreased, these are a must for training and races. These are three invaluable pieces of gear that I will be using for all my future races! Do you have any gear that you must have during races or training runs? I lost a total of 4.2 lbs. 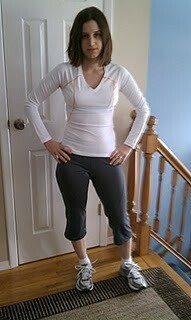 and I lost inches in my chest, arms thighs and waist..my hips remained unchanged. I can see a positive difference in my body, my abdomen is definitely tighter as are my legs. Overall I feel great and that was my ultimate goal. My training for the Virginia Beach 1/2 Marathon does not start for about a month so in the meantime I am going to focus on running for pleasure and strengthening my body. This is going to be a “rest” week with some light cardio, yoga and foam rolling. My “new” training will start next week..my quest for the 6-pack abs!!! What are some of your current fitness and training goals? I have been looking into getting some compression socks, your post was very helpful. Stopping by from SITS!! 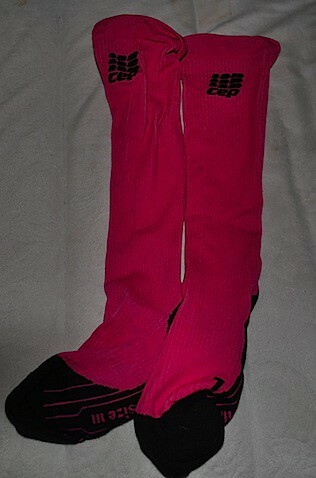 I love my CEP pink socks!! !